T-Bone and a Bass - - - 5 messages. Showing 1 through 5.
i caught this in florida last week. it was 24 inces and 7 and a half pounds, i caught it during its spawn. 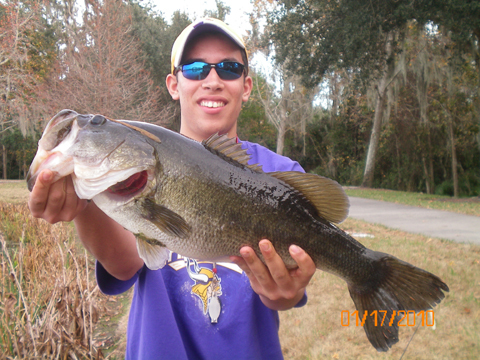 it was the biggest bass i have ever caught!!!!! Wow...in a short sleeve shirt last week...that's pretty stellar. By the way..what did you catch your bass on? Hate to disappoint y'all but its 70 degress right now down here in Fort Lauderdale. Short sleeves aplenty. Having said that I wish I had time to get up there this winter to get on the ice, but work + kids + other obligations won't let it happen. Next year for sure. T, I have the same questions as the Fisher, plus where were you when you caught it. That's a really nice fish.